Our first president had a bit of a contentious and curious history when it came to whiskey. On the one hand, George Washington enacted a whiskey tax to pay off state debts that had stacked up during The Revolutionary War. It sparked off a rebellion in 1791, resulting in federal troops marching on and dispersing thousands of disenfranchised distillers. On the other hand, his estate was, at one point, one of the biggest rye whiskey distillers in the fledgling nation. In a country that had just fought against the tyranny of British taxation, it may seem odd that Washington would be eager to tax something that many families considered to be a necessary commodity for trade. But like most of our founding fathers, Washington was in the business of running a new country. Promises were made to the colonies during the war, and their money had to come from somewhere. This kicked off the nation’s long tradition with the sin tax. In all fairness, Washington never tried to exempt his distillery from the whiskey tax. Though, as a larger producer of spirit that dealt with sales in terms of currency rather than barter, the tax wasn’t as detrimental to his operation as it was to farmers and smaller distillers. After all, it’s easier to pay a tax when you’ve got actual currency on hand rather than trading your whiskey for eggs or textiles. When whiskey is your currency, a tax on whiskey is a direct tax on your disposable income. But back to Washington’s Mount Vernon distillery. At the suggestion of his shrewd farm manager, a Scotsman named James Anderson, Washington had a whiskey distillery constructed next to his gristmill. At the time of its completion in 1797, it was the largest distillery in America, measuring 2,250 square feet and boasting five copper stills and a boiler. Anderson, who had worked as a distiller in Scotland, quickly turned this new endeavor into Washington’s most successful enterprise. During the final year of Washington’s life in 1799, the distillery produced nearly 11,000 gallons of whisky, making it the largest producer of spirits in America. While rye was typically the base-grain, in times of shortage, wheat was substituted in, and the distillery also produced peach, apple and persimmon brandies. The distillery’s most commonly used mash bill was 60% rye, 35% corn and 5% malted barley. It’s worth noting though, that his spirit was sold without any significant barrel aging, so regardless of the mash bill, Washington’s whiskey probably tasted like burning. It’s also worth mentioning that Thomas Jefferson was not a fan of the way Washington handled the whiskey rebellion—particularly mustering troops to march against citizens. 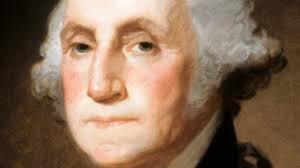 He repealed the whiskey tax as soon as he came into power in 1801.